In Jacksonville, the Thanksgiving Drive benefited Farm Share, Inc., a nonprofit organization with a mission to alleviate hunger and malnutrition by distributing fresh and nutritious food to those in need. Approximately 13,290 pounds of food was collected during the two-week drive. Farm Share, Inc. received the items just in time to distribute to families for the holiday. 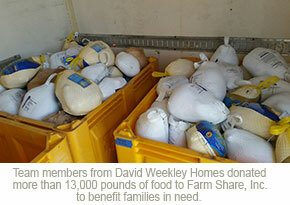 “We cannot thank David Weekley Homes enough for collecting 7,090 pounds of nonperishable items and 6,200 pounds of frozen turkey to help feed so many families,” said Brian Phelan, Director of Farm Share NE Florida.